Daily Survival: Egads, a wart! “Most journalists are restless voyeurs who see the warts on the world, the imperfections in people and places. gloom is their game, the spectacle their passion, normality their nemesis.” – Gay Talese, author What’s a wart? A wart is a skin growth caused by a human papillomavirus (HPV). 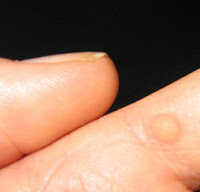 Warts can spread but are not highly contagious. Don't pick at a wart, and wash your hands after touching a wart. Keep hands and feet dry as warts thrive in moist environments. * Plantar warts on the bottom of feet can make standing painful. See a doctor. Note: genital warts are different from common warts and caused by a venereal disease. The treatments below do not apply to genital warts and you should see a doctor. Salicylic-acid can be applied in drops, gels, pads and plasters to dissolve the wart (slowly) over weeks or months. The acid also affects skin so apply with care. If the surrounding skin becomes raw take a break from the acid treatment and let the skin recover. For best results file dead skin off the wart and then soften it by soaking in warm water before applying acid. Freezing – there are over-the-counter aerosols that freeze at -70F and liquid nitrogen used by doctors at a super cold -320F. I once had a toe wart that survived months of acid but died in one application of liquid nitrogen. Duct tape? – a popular home remedy that might actually work. Apply duct tape to the wart, keep it in place for a week, remove it, soak the wart, and pare it down with a filing (emery) board. Just like Salicylic -acid you’ll repeat this for months and must halt for awhile if the surrounding skin becomes red and soggy. Surgery – for super stubborn warts a doctor may use a laser or scalpel but this can be painful and leave a scar.